Heidi: Did you time this piece with the filibuster? Michael: We didn’t time it with the filibuster. The fact that we went to press right as all that was going down was a fortuitous coincidence which required some scrambling to get the piece online earlier than usual. But we timed the feature more generally to Merkley’s rise as an anti-Trump resister in the Senate. We started reporting it right around the time of the Jeff Sessions confirmation in February, of which Merkley was a leading opponent. Additionally, there was an old-school “stop the presses” moment on Tuesday during the filibuster. Though the magazine had already gone to press, we really wanted to change the story to more accurately reflect what was happening in the news, so we contacted our printers and made a last-minute alteration to the story before it was plated. Not something that happens often in magazine land! Did you suspect this would have so much social media impact? We knew the piece would be timely, but the timing couldn’t have been better. 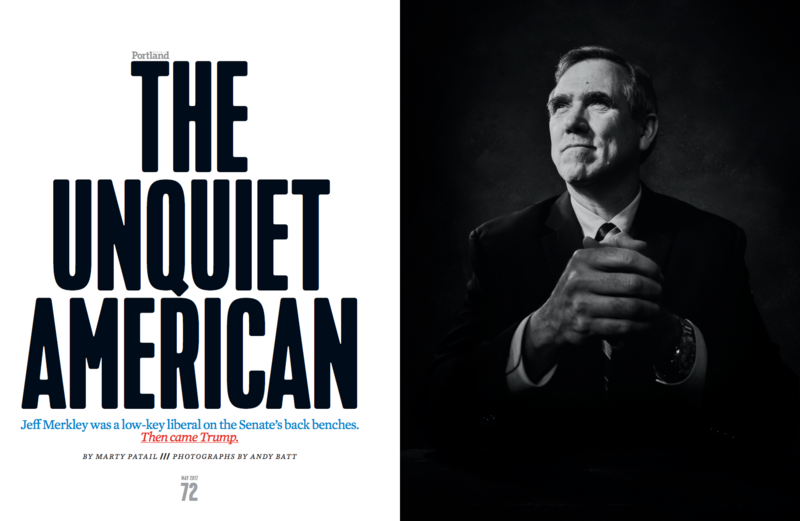 Merkley was already in the news when we posted the story and it snowballed from there. Since we posted it’s been our top story on Facebook, and our second for overall web traffic. What type of direction did you give Andy? 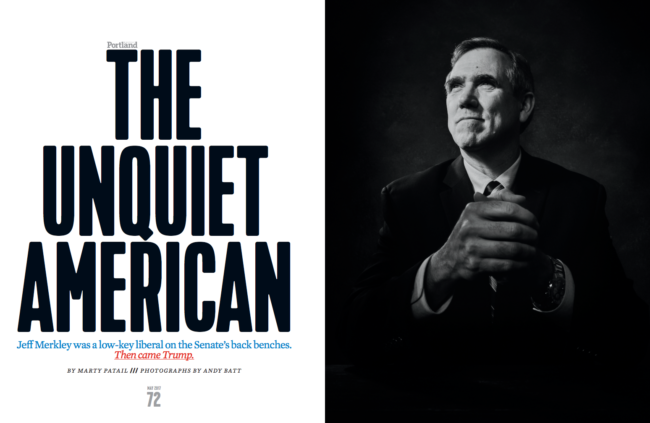 The starting point was me simply asking for a portrait that would make Jeff Merkley appear heroic, since the story was about his rise from quiet sideliner to more vocal leader. During pre-shoot conversations the work of many photographers was referenced, from Penn to Schoeller to Platon. Andy asked me a lot of very specific questions about whether the shot should be B&W or color, what Merkley’s pose should be, shirt sleeves rolled up or down, background colors, suited or casually dressed, etc. A fairly thorough examination of possible image directions. And when I showed up for the shoot he’d built two different sets, one with a black background for a seated pose and one white background for full body. We ended up using the full body shot for the turn page. Are most are your photographers regional or do you fly people to shoot for you? We really only use local photographers—it’s just not budget-feasible for us to fly someone in most of the time. And since Portland has developed into a photographer-rich environment, it’s rare that I need to bring someone in from out-of-town. How much time did you get with Merkley? He’s a busy man. As often happens with celebrities and other people in the public sphere, we had very little time with our subject, less than 45 minutes total; but Andy and his team did amazing work in a short time. Especially considering that Merkley was super sick when the photo was taken. His people requested that we try to make him look “alive”, so with the magic of hair and makeup and good lighting we kept him looking good! Great interview! How can I re-post this on LinkedIn for more people to see?